To Sum It Up: Prince Aleksandar, the only child of Archduke Franz Ferdinand of Austria-Hungary, is left orphaned and fleeing for his life as war is about to break out across Europe. Meanwhile, Deryn Sharp is attempting to join the British Air Service—disguised as a boy. Deryn eventually winds up on board the Leviathan, a gigantic, living airship that comes under German attack and puts her directly in Alek’s path as he and his companions try to make their way to a safer place where Alek won’t be recognized. Review: Not too long ago, I heaped a lot of love on Scott Westerfeld’s Afterworlds. After enjoying that book so much, obviously I needed to read more Westerfeld. So this seemed like the perfect time to finally check out Leviathan. 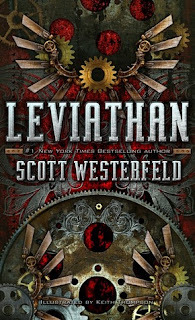 Leviathan presents an alternate version of World War I in which not only nations battle against each other, but there’s also a clash of the minds, so to speak, between the Clankers and their machinery and the Darwinists and their genetically engineered beasties. The titular Leviathan is a beastie, a massive airship that resembles a whale but is actually powered by all sorts of creatures that work together in a self-contained ecosystem. While I found all of this technology, Clanker and Darwinist alike, fascinating, I also struggled somewhat to get through the thoroughly detailed descriptions. There’s no doubt that Westerfeld excels at vividly bringing this world to life, and the accompanying illustrations by Keith Thompson perfectly supplement the prose. But, I don’t know, I just wasn’t into the scientific stuff as much as I felt I should have been. Although Leviathan is written entirely in the third person, we view the story from its two main characters, Deryn and Alek. I absolutely loved Deryn—she’s a real firecracker, that one, and it’s a good thing because she’s trying to pass for a boy so she can enlist in the British Air Service. Young Deryn, or Dylan, as she calls herself, succeeds in joining up, and she and her gigantic secret are soon aboard the Leviathan. Deryn’s spirit is infectious and her determination inspiring; oh, and she’s also really, really funny! Alek took a little time to warm up to, but his character develops very nicely, especially after he meets a certain Mr. Sharp. Even though Alek is not allowed to inherit the Austro-Hungarian throne because of his mother’s commoner blood, he was still raised a prince, and it’s a harsh adjustment to a life on the run from enemies who want him dead. In addition, he’s coping with the sudden loss of his parents. Alek isn’t the self-pitying type, though, and like Deryn, once he sets his mind to something, he doesn’t give up. Now having read two Scott Westerfeld novels that each juggled two POVs in their own way, I can say that he’s a genius at giving each character a distinct, engaging voice. He’s also a brilliant storyteller who paces his novels with expert precision. 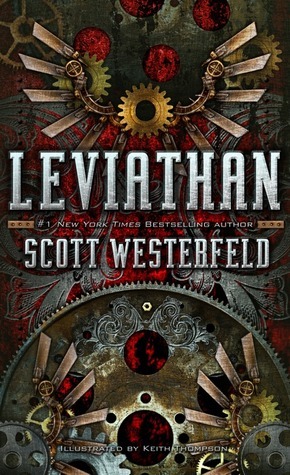 While Leviathan wasn’t quite the page turner that Afterworlds was for me, I still very much enjoyed it thanks to Westerfeld’s simply amazing writing. All in All: The more I thought about this book after I’d finished reading it, the more I realized how much I’d enjoyed it. Recommended if you like your historical fiction mixed in with some steampunk.